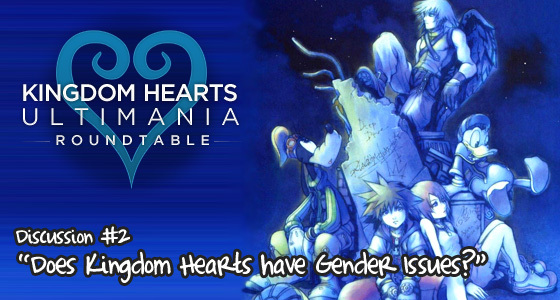 In Kingdom Hearts Ultimania’s second roundtable discussion, established members of our Kingdom Hearts Forum and other Kingdom Hearts fan communities gather to talk about their thoughts on gender representations in Kingdom Hearts. Is Xion a female stereotype or an androgynous fill-in-the-blank? Do two central male characters automatically equal competition? All that and more in Part II of our second roundtable discussion! Is Disney part of the reason for the mostly weak female characters? Are the male characters also stereotyped? All that and more in Part I of our second roundtable discussion! In Kingdom Hearts Ultimania’s first ever round-table discussion, established members of our Kingdom Hearts Forum and other Kingdom Hearts fan communities gather to talk about their experiences and thoughts on the Kingdom Hearts Series. Topics include well-known members of the site discussing how they became a fan of Kingdom Hearts and what it is about the series that is so appealing to the teenage demographic.